This carved stone is possibly the cover of a sarcophagus (no. 33 at Bakewell). It is broken in two places, and is carved with the twelve feet of six men, whose bodies are on another stone. It is dated to the late eighth or early ninth century. 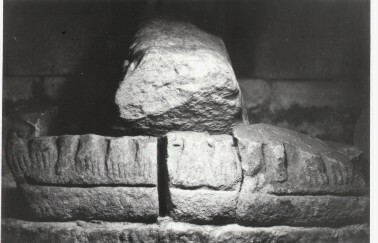 Routh, H.E., , ‘A corpus of the pre-Conquest carved stones of Derbyshire’. In Archaeological Journal (1937) 94, 1-42.